Bees are interesting creatures, and that is mainly why I keep them. The honey, beeswax and pollination are nice too! This page describes how I keep bees. Every beekeeper seems to do things differently, and we learn from each other. Ten to fifteen honey-producing colonies is just enough for me to enjoy messing with on a nice Saturday afternoon. I also keep a few nuc colonies so that queens are readily available for requeening. My bees build up on a good early spring peach and pear bloom. The main nectar flow comes in May and June from wild flowers, including a lot of vetch. Mesquite trees sometimes add to the honey crop. The bees overwinter on an abundance of goldenrod, aster and other fall flowers. 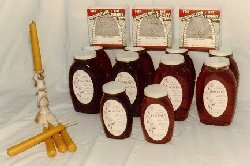 In 1980 I became a beekeeper when I bought three hives from a beekeeper in Houston, Texas. Those bees made a lot of honey from Chinese Tallow trees, and that really got me hooked on beekeeping. 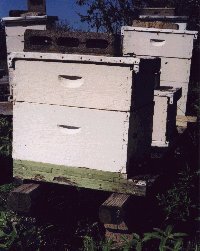 Buying established hives was easier for me to get started, compared with the higher risk of failure with package bees. Beekeeping journals, books, and joining the Houston Beekeeping Association helped me develop some skills. I currently live near Dallas and am a member of the Collin County Beekeepers Association. My bees are in full-depth brood boxes and medium depth supers. If I were starting over, I might use medium depth boxes only, so the the equipment would be entirely interchangable. Sometimes I make supers from old brood boxes. The top and bottom edges of brood boxes are usually the first places to to rot, so I trim them down to super depth using a table saw, and use a router to make the frame rests. I make my own migratory-style covers and bottoms. Migratory covers don't need inner covers, so there is one less piece of equipment on each hive. They also allow hives to be packed tightly against each other when moving them. Telescoping-style covers are convenient for feeding dry sugar and do provide some heat protection, but I look forward to replacing the few that I still have. Railroad ties or landscaping timbers on top of concrete blocks make good hives stands. The bees don't seem to care what color their hive is, but I try to get light colors to minimize heat absorption. Off-color exterior grade paint is an inexpensive way for me to protect woodenware. How well the frames were nailed and wired. Quality and age of the comb. Absence of rot on the boxes and bottom board. I now use both plastic and pre-wired wax foundation. The plastic foundation is durable, results in good brood patterns, and is easily popped into grooved wooden frames. Moth damage? - just scrape it down to the plastic and let the bees rebuild! Wax foundation is drawn out easier by the bees, and I prefer it when there is only a mild nectar flow. I prefer wooden frames with grooved top and bottom bars. I tried plastic frames a few years ago, but they cracked in cold weather, warped and had a lot of burr comb between supers. My hives don't have queen excluders. I think queen excluders interfere with the bees' natural hive organization, and it is another piece of equipment to handle on each hive. Bees will naturally store honey above the brood nest without an excluder, so I don't see much benefit from them. My bee suits are made from a polyester blend. Beekeeping can be hot, sweaty work, and polyester dries faster than 100% cotton. My gloves are made from cowhide, which absorb and evaporate sweat much better than plastic gloves. Brushy Mountain Bee Farm (800) 233-7929 -- A good source for some hard to find items, including the Jenter Queen Rearing Kit and a hive lifter similar to the one on my Gadgets page. Both of these suppliers offer free catalogs. My favorite smoker fuel is dried horse or cattle dung. I like it because it produces plenty of cool smoke and is easy to light. Half-rotted dry wood also makes a good smoker fuel. When checking my colonies, I usually make sure that each colony has brood. If I find brood, I know that the honey comb will be safe from moth damage for at least a month. If I'm too busy to check for brood, I make sure they have plenty of bees and that the bees don't make the distinctive roaring sound that queenless colonies usually make. Matches -- to light Ol' Smokey. Hive tools -- at least one extra tool so I can lose one in the grass! A spray bottle filled with water -- to spray down bees with syrup if I need to join bees from different colonies. Also good for cleaning hands and putting out Ol' Smokey. A squeeze bear filled with honey -- to mix with the water (above). I don't pre-mix because it can ferment. A pencil -- to either mark a special colony or write myself a "next time" note. Hammer & nails -- to repair hive parts. Screen wire -- cut to cover a hive entrance or nuc box entrance so I can move them. Knife -- just comes in handy. Masking tape -- good for closing hives or stopping bees from crawling up my legs. A spare hive cover and bottom is usually available in the bee yard as a replacement, for for starting a new colony. Of course, a few spare queens in nucleus colonies are also available. If a hive is not as strong as it should be, it is usually due to starvation, mites, or queenlessness. If I can't find the reason for a colony to be weak, I usually give it a new queen and/or some sealed brood to strengthen it. 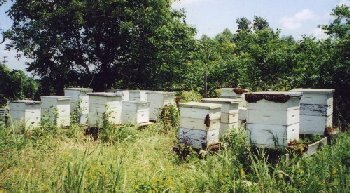 A few nuc boxes in the bee yard provide instant replacement queens and brood. STRESS is bad for bees as well as people. Bees are stressed when they are near starvation, have a poorly-laying queen, are in extreme temperatures, have parasites, are in a recently moved hive, or in a windy location. A colony that must deal with stress will produce less honey and be more susceptible to disease. Reducing stress makes them more able to produce a crop of honey, and that the basis of my overall approach to beekeeping. Starvation is probably the easiest stress to prevent. I try to leave plenty of honey on the hives for the winter and early spring. Sometimes in the spring I will move supers or frames between colonies to help the "light" ones. Varroa mites are a big health threat to my bees in Texas. I treat each colony with an Apistan medicated strip in the spring and fall, while the bee colony size is relatively small. Tracheal mites are not much of a problem here. Fire ants are also a problem in my part of Texas, so I keep my hives off of the ground. Landscaping timbers across concrete blocks work well. 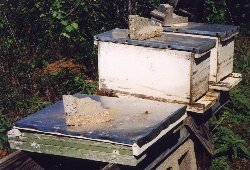 Some of my hives are on especially-made stands that I build soon after the fire ants arrived, but that turned out to be over-kill. I treat each colony in the fall and sometimes in early spring with Terramycin, a general antibiotic that helps with foulbrood and other diseases. I use a Terramycin patty recipe consisting of one 6.4 oz packet of TM25 in 7 pounds of sugar with enough hydrogenated vegetable fat like Crisco (about one 3 pound can) to hold together the hamburger-shaped patties, served on waxed paper on top of the brood frames. One satisfying part of beekeeping for me is creating the final hive products. A few years ago I switched to homemade honey labels. Homemade labels give honey a "local" look.